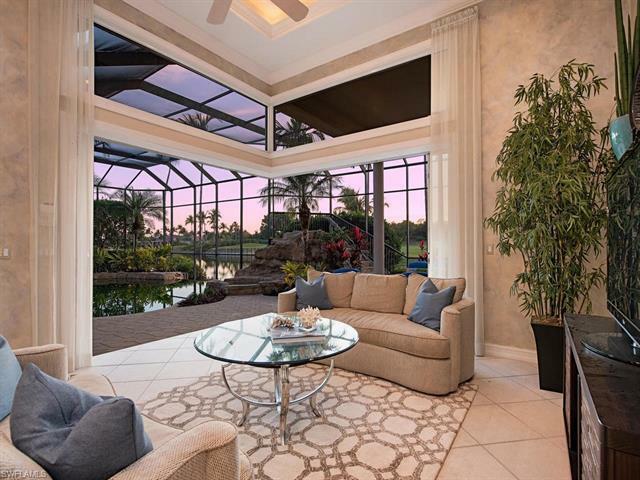 This exquisite Banyan Island, custom estate home in Grey Oaks features over 5, 000 square feet under air and sits on a peaceful cul-de-sac offering owners one of the best locations in this exclusive Naples golf course community. The western exposure emphasizes the beautiful sunsets and the serene lake and golf course views. With no other home in sight, the tropical setting of the impressive outdoor entertainment space boasts complete privacy. The infinity edge pool with a unique slide and a soothing spa is the perfect place to have fun and relax amidst breathtaking views of the lake and the 10th fairway of the Palm golf course.